Our agency welcomed Jessica to our team last month. She joined RSS as our new front desk and administrative assistant. 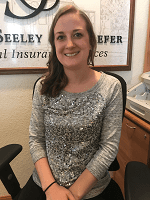 When you first call or stop into our office you will most likely be greeted by Jessica! She comes from a large family (she’s one of seven kids) and is a Colorado native (since she was six months old) and has lived in Broomfield since she was the age of nine. She can read and speak sign language, as both of her parents are deaf. Jessica has been married for a year and a half to her husband, Darian, who works in construction. Jessica took classes for a year in Business Administration and enjoys traveling, hiking, baking, knitting, and trying new foods. She loves watching “The Office” and “Parks and Recreation,” and of course the Broncos games with her dad. Jessica says the most important things to her are her faith, spending time with her husband and family, and being active in her church. We are very excited to have her as part of our team and we hope you get a chance to meet her!